Our New Community Farm needs your Vote! Here’s how: Click HERE and VOTE for All Peoples Community Center! Voting is from August 15th to August 24th. You can vote up to 10 times per day! “La Red De Cultivadores” (Food Growers Network) converts vacant lot into Micro Farm in South L.A. The $25,000 will enable the community to complete the conversion of the vacant lot. Community members and agency partners have secured $35,000 for soil remediation, removal of gravel, acquiring mulch, and materials to build beds, purchase storage units and water line installation. The remaining needs include fencing, drip irrigation, lighting, and electricity. The community members input from several meetings require a thoughtful design which incorporates educational workshop area for trainings with children youth and adults. We want to incorporate green space for forums and gatherings with partners in the area. Our design includes a kitchen food preparation area for cooking classes, nutrition education, sharing recipes, and farm to table potlucks. In addition the design would include a food stand area for various food distribution and harvesting activities. Remember, each person can vote up to 10 times per day from August 15th to August 24th! Think of all the great work we could do if we won a $25k grant from State Farm Neighborhood Assist.® It just takes one click to vote. https://allpeoplescc.org/wp-content/uploads/01_0_MAIN_MICROFARM-e1533850601897.jpg 266 355 Shalanda Mays https://allpeoplescc.org/wp-content/uploads/LogoNewFull_Final_2_520x156-300x90.png Shalanda Mays2018-08-09 14:55:502018-08-09 14:59:12We need your Vote! Favorite Food: I don’t have a favorite food. I always like to try new foods when I can. How would you describe All Peoples Community Center? : It’s a place that has always been welcoming to the community. It is a second home for a lot of people. I’ve spoken with kids who come to the Center on a day when the after school program is closed. They can be anywhere they want, but they choose to come to the Center and hang out here. They know we will never turn them away. I think that says a lot about what we do here at the Center. The students know just about everyone that works here and know that they can speak to any of us whenever they want. The parents that come to the Center know that as well. I’ve had many conversations with parents walking through the neighborhood on my way to lunch. Favorite Part of Your Job: I like when we take the kids to places they haven’t been before. We take kids camping every summer. There are many kids around the neighborhood that have never had that experience. The kids get away from the city for a week to go hiking, climb trees and swim with their friends. My Best All Peoples Story: I was hiking with a group of kids at Camp Joe Ide in the San Bernardino Mountains. One of the kids called out to me and said, “Victor, it’s probably night time in Los Angeles right now. My parents are probably sleeping.” I answered, “Yeah, it probably is night time in L.A.” It was around 3pm. The kid had never been camping, and he thought we were on the other side of the world. That’s the feeling we want all of the kids to have when we go to camp. Fun Fact About Me/Hidden Talent: I know a lot of useless facts. We’re so happy that Victor Perez is part of our All Peoples Family! Roots for Peace Summer Farmternship Program was held from June 19, 2018 – August 1, 2018. Youth worked with Crystal Gonzalez from American Friends Service Committee’s Root for Peace Program as they explored issues that impact the health and wellness of our Community. The Youth assisted with the building of the new community farm site located across the street from All Peoples Community Center. Youth enrolled in the Farmternship also assisted with the design and painting of the Mural located inside the new Community Farm. 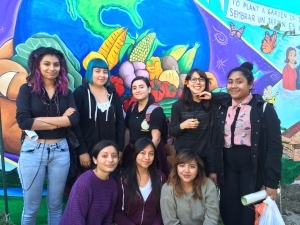 On August 1, 2018, Youth held a Mural presentation for Community Members. We encourage all young people between ages 15 to 18 who identify as POC (people of color) and are interested in building something better for our neighborhoods to apply each Summer to the Roots for Peace Summer Farmternship Program. You can contact Roots for Peace on their FaceBook Page. Farmternship is a project by the American Friends Service Committee’s Roots for Peace Program. On Friday, July 27, 2018, Our College Advisors held a College Readiness Workshop. The workshop is designed for High School students of all grade levels. Topics include: A – G requirements, Individual Graduation Plan, AP Courses, SAT and ACT, and extracurricular activities. These are essential high school requirements to successfully graduate and transfer to a UC/CSU. Please contact College Advisors Susana and Elizabeth at snieva@allpeoplescc.org, emartinez@allpeoplescc.org or (213) 747-6357 ext 147 for more information on our College Corner. Steve is the first one in his family to attend college and is doing the best he can to make sure he takes advantage of the college opportunity. Meet Steve Cayetano. Like the majority of our South Los Angeles Community members, Steve’s parents face the challenges of low wages and high cost of living. Both of Steve’s parents work and do not make a combined income of more than $40,000 a year. Nevertheless, his parents support and encourage him and his 3 brothers in academia, and reached out for additional resources through our YouthSource Center. At 18, Steve has just completed his tenure at our YouthSource Center Program. This year Steve graduated with honors as the Class Valedictorian from NAVA College Preparatory Academy. He’s been academically engaged in all his course work and achieved a high GPA. Steve applied to the Charles R. Drew University Public Health Academy which is a Summer program to help students understand health policy and issues related to health. He was one of the few students accepted into the academy, and completed the 3 month Summer program on Saturday, July 28, 2018. College courses in the Charles R. Drew University Public Health Academy included issues on Mental Health, Introduction to Public Health, and Psychology. Steve applied and has been accepted to Middlebury University in the State of Vermont for Fall 2018. Through his hard work and dedication, Steve also just learned that he was picked for a scholarship from the Stifel Financial Group. All Peoples Community Center assisted in seeking a sponsor for Steve’s flight to Burlington, Vermont so he can began orientation on August 29, 2018. He looks forward to his orientation and the required Middview Trip-Wilderness Exploration that involves outdoor hiking, canoeing, rock climbing, and camping as part of their student enrollment process. Steve has also been very active in civic engagement in our South LA Community. He’s participated in Community events at All Peoples, Best Start Metro Los Angeles, his High School and as a Poll Volunteer in the recent California Primaries in June. On Tuesday, July 17, 2018, Steve was a student speaker at the Power California event at the Japanese American National Museum. He discussed the movement he helped lead at his high school to register 200 young voters. Steve was also able to share his high school experience and voice concerns regarding Community issues that our young people are facing. Steve has strong leadership skills and is a great mentor to Youth in the Community. Through Family, Community, available Resources, and Steve’s personal resilience and determination, Steve will be the first in his family to attend college. We’re proud of Steve and will be supporting and cheering him on as he starts the next chapter of his life at Middlebury University.